First, the song. I am a little obsessed with this song and I think the video is so cool too. have a look see. Isn’t that just the cutest video and such a great song. So let me show you the nails. Ok so it’s not very good but let me walk you through it. I hope you’ve seen the video then it might make more sense. On my index finger I have the mac daddy dude that beats everyone. I used Tip Top – Surfer girl with one coat of Nubar – Treasure over it. Not that he is sparkly but sparkle makes everything better right? 😛 I then used Chian Glaze – Jungle queen for the darker part of his eyes and and his nose. I used Tip Top – grape to meet you for the inside of his eyes and stripers to do the horn and the attempt of hair around the face. We will call it a day. On my middle finger is the score board. I used Essence – Black is back and a white stripes to make the lines. I then used a matte topcoat to make it look more like a black board. On my ring finger is the unassuming little pink and white care bear that come in to save the day. 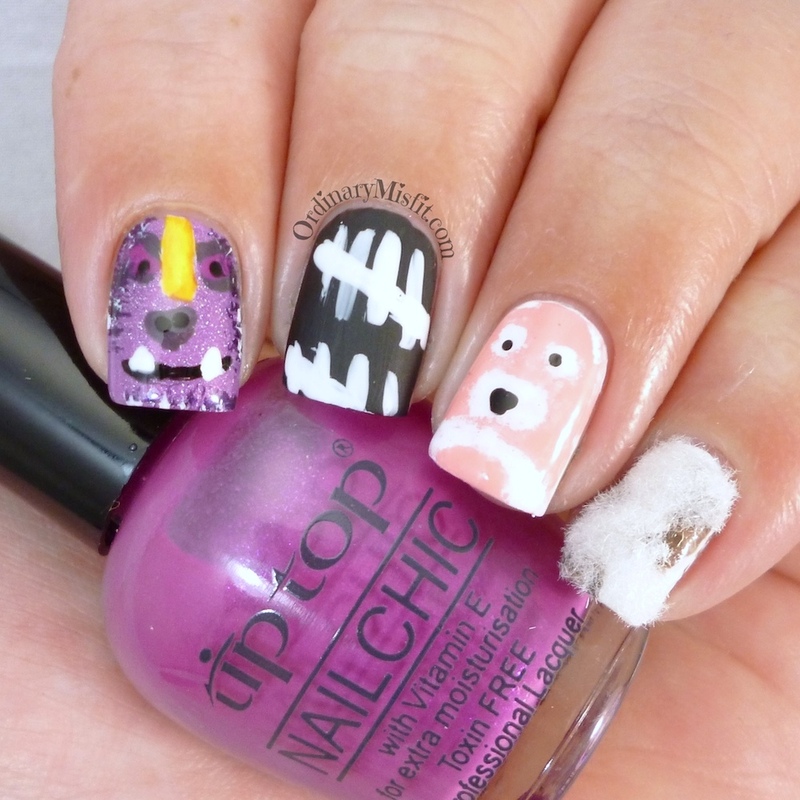 I used Tip Top – Marshmallow bunny and Sinful Colors – Snow me white . I used a piece of sponge to sponge it on to give it more of a fluffy effect. Of course, my camera hates this pink so it just looks wrong. 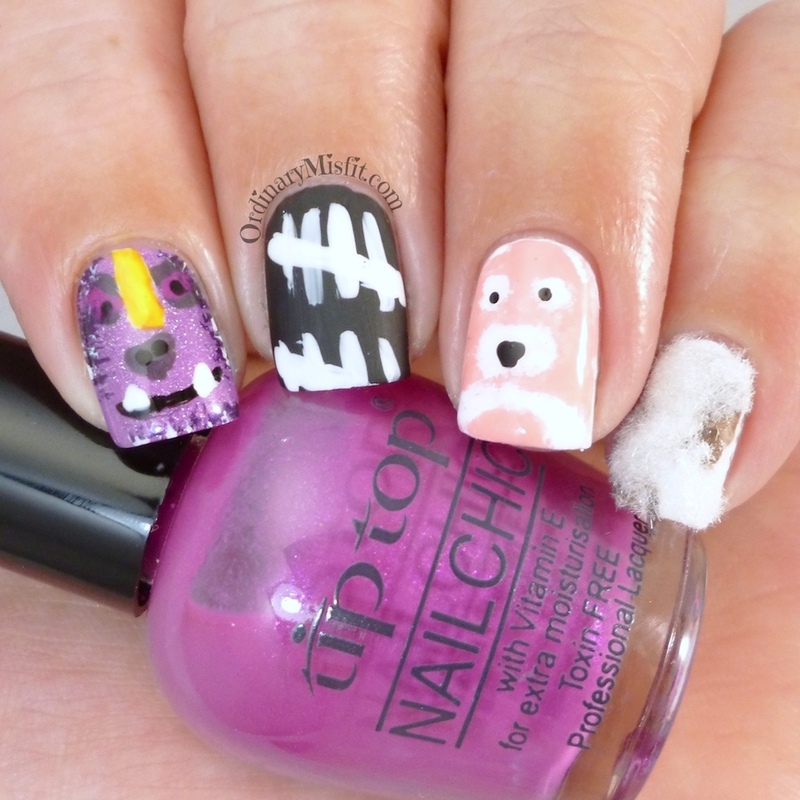 On my pinky I used Sinful Colors – Snow me white and Chian Glaze – Foie Gras to do little ‘body parts’ of the ‘broken’ teddy bears. I then used white flocking powder to represent the inside fluff of all these broken bears. And that is that. Like I said, my freehand skills are not that great but don’t you think it is a great video? I love the little characters. And I love the song. What do you think? Did I nail it? This is 3 coats with no topcoat. It is super sheer at first which is ideal for layering but it layers beautifully. And it has holo glitter. Who doesn’t love holo glitter? This is 2 coats with no topcoats. I love this colour so much. It is a light purple shade with a subtle shimmer that creates depth rather than sparkle. it’s beautiful. This is a 2 coats with no topcoat. 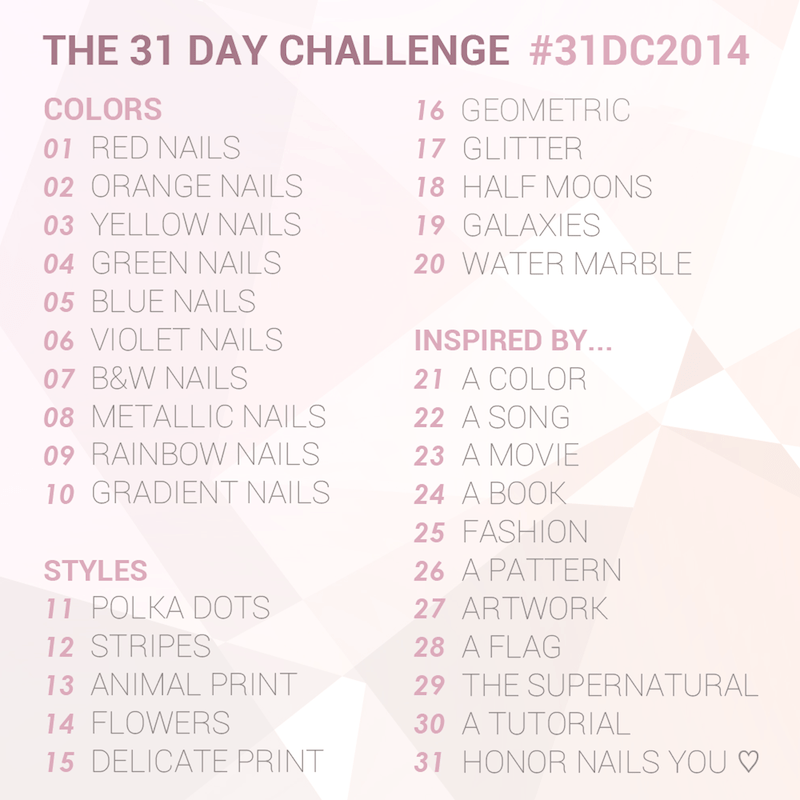 This pink didn’t fare well with my camera and it looks more coral than pink but it is a pastel pink creme. It’s beautiful but one of the Addict line that I think has been discontinued. This is 2 coats with no topcoat. 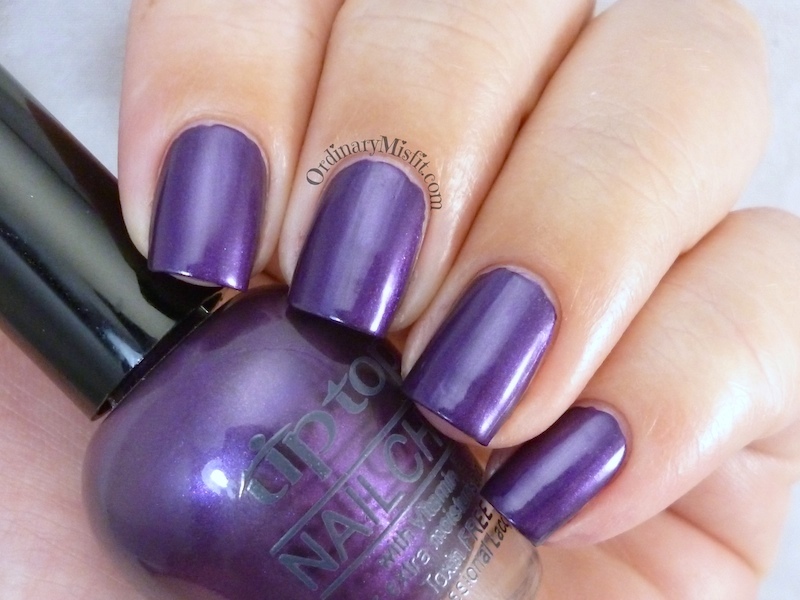 A bright purple colour with subtle purple shimmer. This is one of the few Tip Top polishes I have that doesn’t dry super shiny. This is 2 coats with no topcoat. A beautiful dark purple with a subtle shimmer. I really love this colour and the formula and opacity are amazing. This is 2 coats with no topcoat. It is a purple toned greyish polish with a purple shimmer. You don’t see it much on my nails but you can see it beautifully in the bottle. Great formula and opacity. This is 2 coats with no topcoat. A beautiful brown creme with buttery formula and great opacity. This is such a beauty! Kwaai mani too! I like the purple mannetjie! OMG. I know the song, but hadn’t seen the video. It’s so clever! I love how you interpreted it…too cute!! !